Our archery mule deer hunts are conducted using the aggressive 'spot and stalk' method. We spot them and then we go after them. This is a different experience for most of our hunters and adds a whole new dimension to their hunting experiences. Expect a lot of action. We use very few, if any, tree stands for our archery muley hunts. 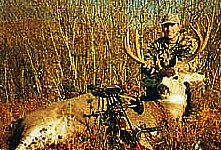 Hunt big game Mule Deer with Trophy Hunters Alberta in some of Alberta's finest Mule Deer areas, namely the foothills area of southwestern Alberta, the eastern slopes of the Canadian Rocky mountains, the prairie giants in the south and east and the monsters of the famous Calgary Bow Zone. Our archery mule deer guides are all very experienced bow hunters. In fact in the past few years, the #1, #2 and #4 indoor/outdoor compound and #1 recurve shooters in Alberta have all worked with THA. Our #1 ranked Alberta compound and recurve shooters are also #1 ranked in Canada. With such quality guides, it is easy to understand how we can provide a world class archery mule deer hunt. We offer four distinct types of Archery Mule Deer hunts as summarized below. These hunts are operated in the forested area leading into the slopes of Canadian Rocky Mountains (WMUs 318, 320, 322, 324, 326, 330, & 429). These areas have much more cover for muleys than is available for our Foothills Archery Hunts. The season is much shorter since the rifle season in these WMUs generally opens in mid to late September. Ground blinds, some tree stands and limited spot & stalk are the preferred methods to hunt these dark-horned monsters. Their spruce rubbed antlers are much darker than their open country poplar rubbed cousins in the Foothills. Accommodations are at a B&B, full service lodge or a local motel. Similar to our Foothiils areas, our Mountain Archery Mule Deer hunts generally occur during the annual velvet to initial hard horn stage of a buck's development. We are able to hunt these trophies during the very early season when they have not been hunted for many months and remain largely undisturbed. Due to the nature of the mountain habitat and terrain, hunters will not see as many mule deer on our Mountains Archery hunts as on our open country style hunts. These hunts are operated in the Porcupine Hiils (WMU 304) and provide a high success probability for our hunters. There are lots of mule deer and some very serious trophies. Transportation during these hunts is generally by THA 4x4 with limited to extensive walking required depending on your level of physical fitness. 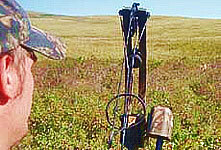 Accommodations are at a ranch, B&B, cabin or local motel. Our Foothills Archery Mule Deer hunts generally occur during the annual velvet to pre-rut stage of a buck's development. We are able to hunt these trophies during the pre-rut when they have not been hunted for many months and remain largely undisturbed. During these hunts, we will do lots of spotting, walking and careful, planned approaches in open country. We conduct these hunts annually from September 1 > October 24. Another book animal for Tim Wells adding to his many already book harvests with THA. Tim Wells, outdoor writer, host of the TV series 'The Sportsman's Game Bag' and producer of many hunting videos for the World Hunting Group, harvested this 165 class mule deer on a filmed THA hunt. 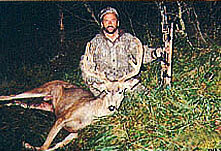 Tim has hunted with THA for 11 consecutive years and has harvested a over a dozen P&Y deer, all fully filmed. Watch Tim's TV program for ongoing shows. Our Prairie Archery Mule Deer hunts are our highest demand hunts and are operated in the wide open prairies of southern (WMUs 110, 134 & 140) and are spot & stalk hunts for Alberta's largest trophy mule deer. The land consists of mostly privately owned agricultural and grazing areas rich in food and water sources for deer. These hunts are definitely action packed hunting experiences where a hunter typically sees lots of bucks and usually some serious trophies. The extremely limited number of allocations available for non resident hunters makes these hunts the most desirable, high demand archery mule deer hunts in Alberta due to the very limited pressure on the muleys. For example, in these WMUs there are only 4 archery mule deer non-resident allocations per WMU. There are lots of mule deer and some very serious trophies. Spot & stalk and ground blinds are the preferred methods to hunt these free ranging, open country Mule Deer. Transportation during these hunts is generally by THA 4x4 with moderate to extensive walking required depending on your level of physical fitness. Accommodations are at a ranch, B&B or local motel. Our Prairie Archery Mule Deer hunts generally occur during the annual velvet to pre-rut stage of a buck's development. We are able to hunt these trophies during the pre-rut when they have not been hunted for many months and remain largely undisturbed. During these hunts, we will do lots of spotting, walking and careful, planned approaches in open country. Roy Bell of San Diego harvested this beautiful P&Y muley in unmarked total velvet on an early season hunt. The Calgary Bow Zone (WMU 212) is a private land hunting zone renowned world wide for its record class deer. This is a productive hunting area where archery is the only legal method to hunt big game. It is one of the two areas in Alberta where archery hunts are allowed during the annual rut without the usual incursion of rifle hunters. Although access is always a challenge in this area, our success rate is generally very good. 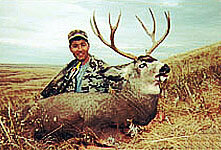 Ground blinds and tree stands are the preferred method to hunt these Mule Deer. We only utilize spot & stalk when the habitat and terrain are conducive to this style of hunt. We never want to chase our muleys from accessible land to posted land. Transportation during these hunts is generally by THA 4x4 with limited to extensive walking required depending on your level of physical fitness. Accommodations are at a B&B or local motel. We are able to hunt these trophies during the entire season from velvet and pre-rut when they have not been hunted for many months through the full rut. Since this is an archery only hunting zone, the mule deer remain largely undisturbed for the entire season.